We currently have landscape sizeed American Holly. e are growing "Dragon Lady" and "Red Splendor" - both upright hollies. 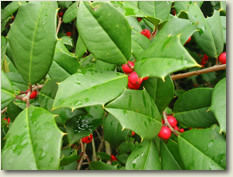 American Holly is one of the finest plants for your garden. They need a bit of space and protetion from our winter winds to establish. The plants we have are really looking good and will soon make fine specimens. Go to Index of Trees for inventory and price.